Seeu.me widens the horizon of webmail services offering its own innovative features - Audio and Video Emails. This functional email system can do multiple tasks that we always wanted along with just regular emails without the annoying spam filled advertisements. Sending video messages with seeeu.me is as easy as sending an email. Just login to your account, record and send! The recipient gets a friendly email message telling them they have a new video message, and they can watch it with a single click. 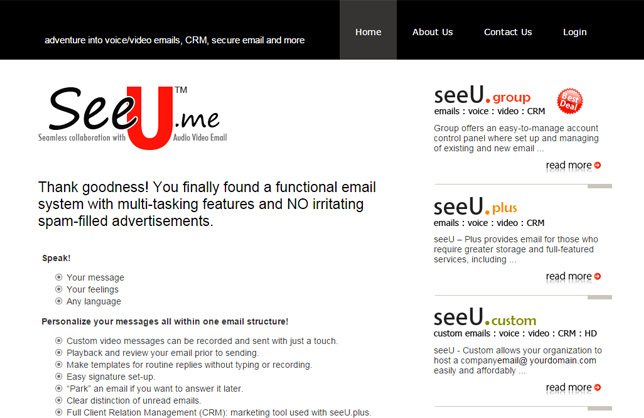 Seeu.me – Custom allows you to eliminate email complexities and the high cost of running your own email server. Custom offers the ease of an email account control panel where you can set up any number of user accounts with your domain. Seeu.me – Group offers an easy-to-manage account control panel where set up and managing of existing and new email accounts is easy to use. One person can hold the subscription at an affordable rate while managing a group plan for family or customized group users. Seeu.me – Plus provides email for those who require greater storage and full-featured services, including VOICE/VIDEO email features and integrated CRM (customer relationship management) applications. In addition, seeu.me provides easy transfer of existing email accounts (including POP/IMAP support) for a nominal charge.